Socks Yeah! has been available for a few months now and there are loads of brilliantly executed socks out there. I'll share some of the best at some point soon. What has interested me recently though, is what else the yarn has been used for. A little digging through Ravelry and Instagram threw up some really impressive projects. This Super Eyelet Fine shawl has been designed by Fiona Wright, a partner in The Woolly Brew yarn shop in Pitenweem. It is available as a free download from Ravelry now, and should knit up fairly quickly so you have something new to keep you warm during cool spring evenings. This shawl, made by Aiko in Rachel's favourite shade, features a textured section that will look good at the back or the front of your neck, depending on how you wear it. All proceeds from the sale of this pattern go to a scholarship fund at the Australian National University in memory of the designer's brother. This Northallerton hat, made by Carol, from Coop Knits Toasty Volume 1 shows that Socks Yeah! looks good in stranded colourwork, as well as in lace patterns. I could certainly do with wearing it to protect my head from the piercingly cold wind that I've been out in this week. If crochet's more your thing than knitting, be sure to have a look at Crochet Yeah!, a book of crocheted accessories in Socks Yeah! from The Crochet Project. More on that soon! In a panic about what to get for your child's teacher? Need a bauble for your knitting group's annual decoration swap? Want something classy, but quick to make for your tree? Choose from stranded colourwork, beaded or cabled stockings. Or even better, make all five! Because the projects are relatively small scale, these are a great opportunity to try out something new. I've been told that I should have a go at the cabled and beaded one on the far right. The trouble is, I've never put beads onto a knitted piece before. Fortunately, Cat Bordhi's YouTube video, featuring Wayne's World stye extreme close-ups, has come to my rescue. The For the Tree set is available now from the Coop Knits Ravelry store. Be sure to share your progress and photos with the Coop Knits Ravelry group. If you have previously purchased the set, your Ravelry library will have an update waiting for you. The first autumn KAL came to a close a little over a week ago. 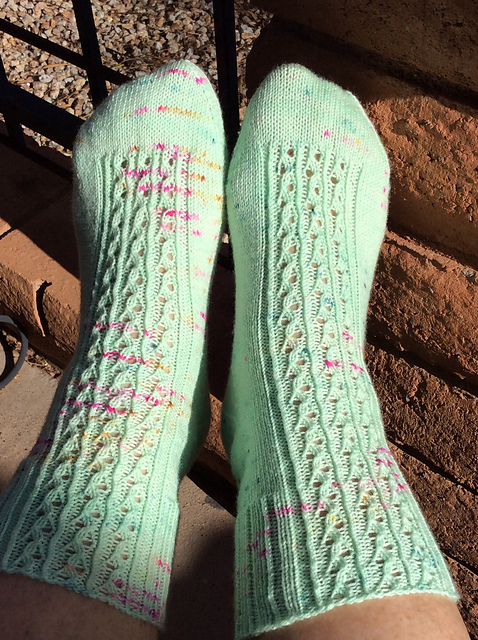 The two patterns were Decca and Delbert from Coop Knits Socks Volume 2. Here's a selection of the finished socks posted to the Ravelry thread. First are the Delberts. From left to right, the projects of agita, Rubywool and pookiebb. Then the Deccas of aiko1122, writergirl3 and gillianrp. As ever with knitalongs, there is a random prize draw, with two yarn prizes and three pattern download prizes. Using a random number generator, the randomly selected yarn winners are MissFrances and jillrlambert, and the pattern winners are mandyscragg, aiko1122 and writergirl3. Congratulations to you all! 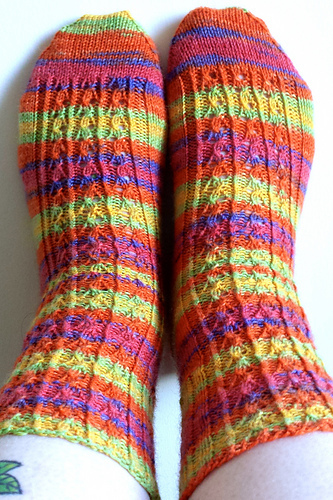 The next sock KAL has started already (Wilbert and Orville) and you can post your progress on the Ravelry thread. Happy sock knitting! If you haven't already seen it, Toasty Volume 2 is available now. It features 9 accessories in cables and colourwork to keep you toasty through the coldest of winter days, all designed in Titus yarn. The Hartwith hat is shown in Goathland, one of the newer shades of Titus. Of all of the hats in the book, this is probably the one I'd like to own myself. I hesitate to say that though, as I'll no doubt have needles and yarn thrust into my hands with the instruction, "Off you go then!" 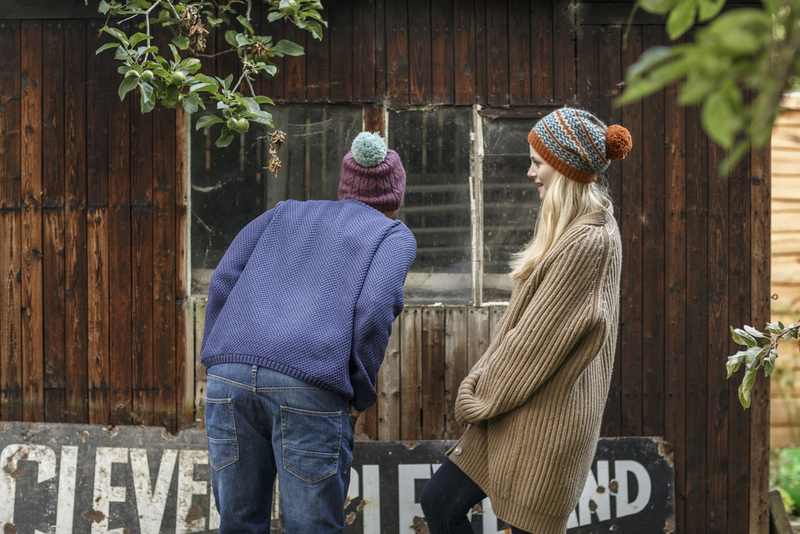 With three different motifs and a striped crown, the Birstwith hat has plenty to keep knitters who enjoy colourwork interested. The geometric colourwork pattern in the Hebden cowl is repeated in the hat. Four colours of Titus are required, but only one skein of each is sufficient for both the cowl and hat. All of the hats in Toasty Volume 2 can be finished with a pompom if you wish. The big questions are then, "What colour?" and "How big?" I'll leave you to make that decision. Toasty Volume 2 is available as a book (with free digital download code) from the Coop Knits shop, or as a download from Ravelry.